As a child I discovered how it feels to suffer injustice. That sparked my interest in social justice—instead of reading fiction and fables, I chose to read about oppression, poverty and triumphs over adversity. To this day the desire to change inflexible, impersonal systems defines who I am and what I do. Why accept the status quo when with imagination and grit you can improve it? Why ignore disparities in education, employment, health, housing and the criminal justice system that create and sustain a permanent underclass? I know what it takes–audacity, creativity, conviction, tenacity and alliances–to replace systems that perpetuate injustice with those that foster opportunity. I founded Achieving Change Together to share my knowledge and imagination with social change agents whose initiatives promise hope and justice for all. Barbara Rady Kazdan is widely known for her leadership of Ashoka-US, the US arm of a global organization of leading social entrepreneurs--individuals with breakthrough solutions to chronic societal challenges. As the US Director, she set the bar for selecting quality candidates for lifetime election as Ashoka Fellows, and supported their success through coaching and a robust learning community. Prior to Ashoka, Barbara co-founded Interprofessional Fostering of Ophthamic Care for Underserved Sectors (InFOCUS), where she created "vision stations" offering affordable eye care and eyeglasses in poor communities at home and abroad. Previously, Barbara founded the Houston READ Commission, leading this mayoral literacy agency to national prominence for pioneering comprehensive adult literacy programs at thirteen technology-assisted learning centers, each funded by a unique cross-sector partnership. She helped shape federal policy to direct literacy resources to community-based initiatives, organized an award winning literacy awareness campaign, established a 10 city demonstration project that became a national initiative and led state and local coordination planning on the Governor's and Mayor's literacy task forces. Barbara also founded Trisector Enterprises, a consulting practice to promote public/private/non-profit partnerships. Barbara earned a BA from the University of Michigan and completed the Management Program at the Jones Graduate School of Administration, Rice University. She is a national board member of Humane Farm Animal Care and the Media Policy Center, and an engaged member of The Transition Network-DC Chapter. In 2010, Barbara earned certification as a JobsOver50 Career Coach. 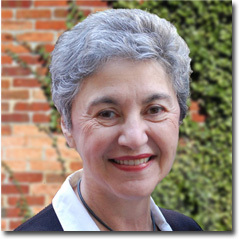 Tapping 30 years' non-profit leadership, after serving as Ashoka's U.S. Director, Barbara founded Achieving Change Together to advise and connect social entrepreneurs. The author of creative nonfiction, her essays appear in Contagious Optimism, 10 Habits of Truly Optimistic People, BetterAfter50.com, LivingBetter50.com, and NextAvenue.org.